Local 22 and 44’s Chief Meteorologist Sean Parker visited the Mettawee Community School on Tuesday, Feb. 23. He was greeted by MCS Principal Brooke DeBonis and school administrative assistants Cheryl Chalmers and Sue King (pictured l-r). Parker gave presentations to students in grades K-6. 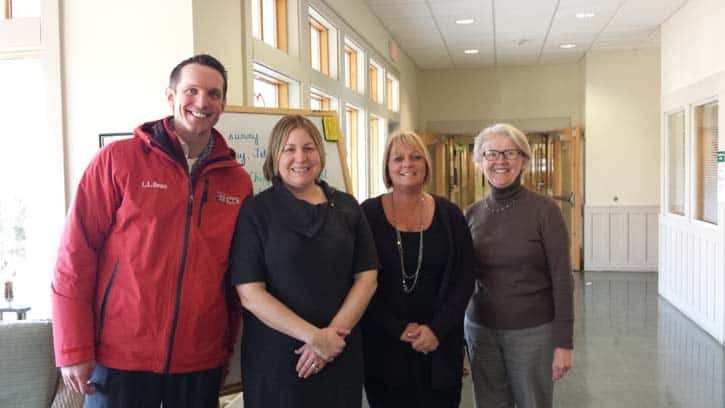 WEST PAWLET — Earlier this winter Mettawee Community School Principal Brooke DeBonis contacted Local 22 and Local 44 Chief Meteorologist Sean Parker and asked him to come visit the school to teach the students about weather. DeBonis’ request was fulfilled Feb. 23. After the presentation fourth graders Tucker Haynes and Breanne Weeden both said they were very interested in the weather balloons, and how much information the tethered digital box gathers during its flight. Parker explained that the weather balloon results, called an atmospheric sounding, provide the measure of dew point, temperature, wind speed and direction and much more. Students learned that the digital recording box has a GPS in it. Once the balloon reaches a particular altitude, and pressure, it pops sending the box back to Earth. The GPS helps scientists retrieve the instrument, but not always. The information gets plugged into computer models and weather forecasts are based upon these models. Parker also talked about thunder and lightning, a topic that most students felt strongly about. After a discussion of the definition of thunder, Parker showed a video recorded in Vermont that many believed was the forming of a tornado. Sixth grader Taylor Amaral said she liked learning about teleprompters, worded screens from which both newscasters and meteorologists read. Fourth grader Emily McFadden said she liked learning about the empty green screen that meteorologists stand in front of during the weather forecast portion of the newscast, while looking at a computer screen for the actual maps being broadcast. Additionally, Mettawee families and school community were delighted with Parker’s Tuesday night on air “shoutout” about his visit during his evening broadcast!